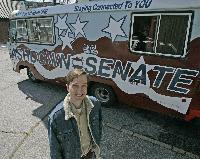 Pete Ashdown stands near his 1973 motor home, the 'Blue Goose,' which he uses for his senate campaign. Democratic Senate candidate Pete Ashdown hopes to visit every Utah town before Election Day - an ambitious trip made even more so considering his mode of transportation. Ashdown and family will travel in a 1973 Superior motor home, which for the past few years has languished in his father's yard. Campaign volunteers recently spruced up the "Blue Goose," including a new paint job touting Ashdown's candidacy. The motor home serves a nostalgic role - as a child, Ashdown saw most of the West through its oversized windows - and a campaign purpose as well. Written on the back is this subtle jab at five-term Republican Sen. Orrin Hatch: "This motor home was new in '76." "It does the job and gets me around," Ashdown said. "But it would be nice to have a new model out there." Hatch was first elected in 1976, ousting Sen. Frank Moss, in part because he claimed Moss had served too long. Hatch's opponents have regularly criticized his long stay in Washington. "It comes up every year that he runs, but he seems to be doing a great job for the people of Utah," said Dave Hansen, Hatch's campaign manager. "It's nice to see Pete going around the state and meeting with some of the people the senator has been speaking with for the last 30 years." In the year since announcing his long-shot candidacy, Ashdown has put more than 10,000 miles on his personal car, driving to more than half of Utah's 29 counties. He plans to put more than that on the Blue Goose. "I think it shows rural Utah that I care about what they think, that I'm willing to get out and talk to them and hear their concerns about what is going on in Washington," he said. So far, Ashdown has taken the Blue Goose to the Tooele and Box Elder Democratic conventions. He plans to hit at least 10 more, including today's Duchesne County convention, before embarking on his statewide tour with his wife and three children. The heater doesn't work, the gas mileage is crummy and just about every other moving part is suspect, but Ashdown isn't too worried. He bought road-side coverage and his father is a mechanical wiz who has replaced the engine twice since buying it. The old motor home runs counter to Ashdown's tech-savvy persona. He's the owner of XMission, one of Salt Lake City's oldest and largest Internet Service Providers, and he loves new gadgets. He has a few ideas on how to modify the motor home. He plans to install an Internet connection accessible statewide, so he can write items for his campaign blog on the road. And he plans to include a Web cam and GPS transmitter so people can track his progress through his campaign Web site, http://www. © Copyright 2006, The Salt Lake Tribune.